A popular item on many a creatives‘ wishlist is to see a car-dominated commercial street transformed into a pedestrian-only plaza brimming with outdoor diners. Some fortunate residents in NYC may not have to wait much longer. 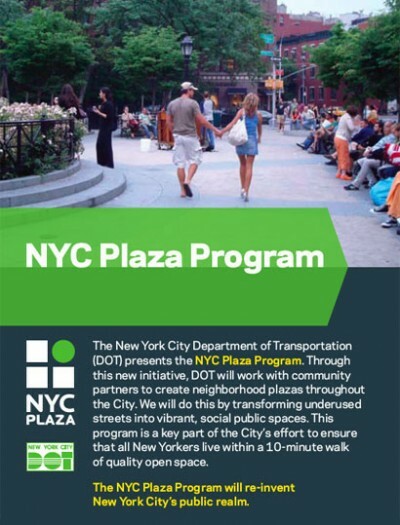 Following a rather astounding recent track record in prioritizing pedestrians over cars, the NYC DOT (Department of Transportation) presented its latest and greatest, the NYC Plaza Program. When was the last time a Department of Transportation issued a statement like this: NYC DOT will work with community partners to create neighborhood plazas throughout the City. We will do this by transforming underused streets into vibrant, social public spaces.” It’s real, and it’s happening now. The first round will award eight projects in any of NYC’s five boroughs by funding the redesign and redevelopment of the street into a plaza, including possible amenities such as tables and seating, trees and plants, lighting, public art, water features and drinking fountains. In addition, the NYC DOT will provide $50,000 each year for three years for a nonprofit to provide outreach, marketing and event planning. The deadline is August 19, 2008. Looking forward to seeing the results, as well as hearing from other cities bold (and smart) enough to follow NYC’s lead.